Play if… you love books or movies about computer-based terrorism or hacker attacks. Avoid if… the thought of hackers gaining control of our nuclear arsenal makes you lose sleep at night. Description (from the company website): A group of renegade hackers has taken control of the United States nuclear arsenal and have ordered a strike on several major US cities…you’d think it’d be more secure than that, but that’s not the point. As the Secret Service’s ranking agents, it falls upon you to disarm the attack before tragedy strikes. Use your knowledge and skills to get the job done. The fate of the country depends on you. Good luck, Agents! Note: If you played Save the White House prior to June 2018, this is a completely different room with new decorations, puzzles and story. Staging Area: Room Escape DC has a lobby with multiple tables, couches/chairs, vending machines, a sign-in station and two restrooms. Metro Access/Parking: No metro access, so you’ll have to drive or Lyft/Uber. But there’s plenty of parking in adjacent garages. Description of the room: You enter an L-shaped room with the front part mimicking the Oval Office. There is a desk, some other furniture, and artwork and photos along the walls. Understanding of the Mission: Hackers have taken control of the U.S.’ nuclear arsenal and are attempting to deploy missiles. As ranking Secret Service agents, it is up to us to figure out how to stop them. Did We Escape: Yes and damn proud of it. Our Suggested Party Size: Having done the first version of this room, we were delighted when they offered us to come in and review the new version. We’d say 4-ish would be fine for this. Did the room challenge the entire team? As with the original, there was a lot of back and forth with this room. Thankfully, it was a little easier (in that respect) this time. Yes, though. 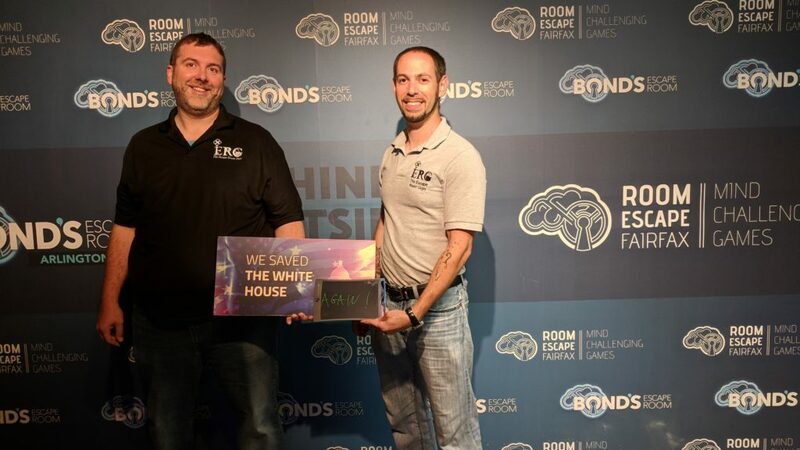 Jason and Mike donned their best Secret Service identities and stopped hackers from nuking the US. The Wine House – stop in for a glass of wine and dessert. Play if… you have your own bunker or have one designed in your head. Avoid if… the fear of being locked in an underground bunker by an automated computer system for the rest of your life makes you a little, um, well, uneasy. Description (from the company website): Earth’s nuclear holocaust is over and after several years the air is finally breathable again. The shelter Network has unlocked the airlock for one hour. If the airlock is not utilized in that hour, the Network will assume everyone is dead and seal the shelter forever. It is up to you to follow the clues and unravel the puzzles the Caretaker created to ensure his safety. In the end it led to his demise…will it lead to yours?? Staging Area: EXIT Plan has a great reception area (two, actually) with lots of chairs. There is a large flight of stairs to reach the main lobby. Metro Access/Parking: This spot is in downtown Leesburg in the historic district. Lots of street parking, and there is a small lot right behind Macdowell Brew Kitchen. Note: The ERG were given the opportunity to try out this room for free, with the understanding that we would continue to provide an honest review and follow the same process we’ve used on all of our other ratings. Description of the room: You start out in a very bare bunker with nothing but a flashing light [Kill me now… -Jason] and a locker and some stuff on the walls, but that changes quickly (in our case, at least). Understanding of the Mission: A very straightforward mission: find your way out of the bunker into the airlock so that you’re not sealed in forever. Our Suggested Party Size: This room is rated 2-8 people, and we had 6 experienced people, which should be good number. 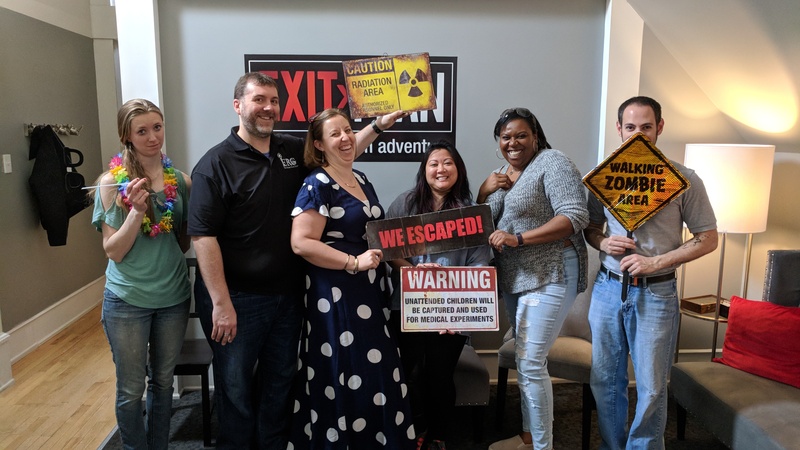 Team Disturbed Friends (Steph, Mike, Heather, Steph, and Jason) were able to emerge from the hidden bunker before being sealed in for eternity. Play if… you love caves. Avoid if… nuclear war is one of your paralyzing phobias. Description (from the company website): You and your team of elite soldiers are given a mission to infiltrate a top-secret military bunker and to stop a nuclear missile about to be launched . You have 60 minutes to stop the launch and escape the bunker before time runs out! Staging Area: Lobby has a lot of space to sit on couches and chairs, and the tables have a few puzzles to work on and get your mind revved up before starting your room. The front desk attendant will also offer a small bottle of water. Restrooms are right next to the lobby. Metro Access/Parking: King Street metro w/ a .4 mile walk (or take the free King Street Trolley to N. Payne St.); street/garage parking. Description of the room: You enter an underground bunker that looks like it was built during WWII. Lots of military equipment around. Understanding of the Mission: Rescue a comrade, find a way to stop the launch of a nuclear weapon, and escape the bunker. Time Remaining: This one was close. Single digit minutes remaining. Our Suggested Party Size: We thought 6 was perfect. Did the room challenge the entire team? Yes. Members of our team (other than the ERG): Tammy, Bill and Stephanie. Eamonn’s A Dublin Chipper – a great place to stop for some fish ‘n chips, and a nice cold beer. Vermillion – stop in for a drink and some appetizers.